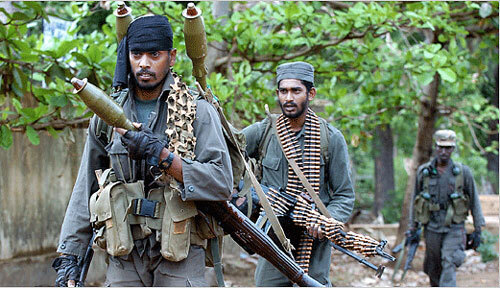 The government is winning the civil war against the minority Tamils to a background of great power rivalry. China and the United States are competing for influence on this strategic island on the world's trade routes. The then US ambassador, Jeffrey Lunstead, made the situation quite clear and warned the LTTE that if it did not quickly agree to a settlement on Colombo's terms it would face "a stronger, more capable and more determined Sri Lankan military." He added "Through our military training and assistance programs, including efforts to help with counter-terrorism initiatives and block illegal financial transactions, we are helping to shape the ability of the Sri Lankan government to protect its people and defend its interests." In March the United States seriously proposed landing a brigade of marines supposedly for the purpose of humanitarian aid. The Sri Lankan government declined the offer. India has sent military medical teams but with its large Tamil population and the memory of a previous disastrous intervention, is reluctant to do more. Secretary of State Clinton's latest statement accuses the Sri Lankan government of "causing such untold suffering" and urges a "political solution". It has taken her and her advisers a long time to notice. However the Sri Lankan government has insured against fickle US support by building a relationship with the Chinese government. In 2007 they were granted the right to build port facilities and an airfield in the south of the island. In exchange the Chinese have supplied military hardware. As important, with Russian backing, they have blocked the long delayed US initiatives in the United Security Council to discus the "humanitarian crisis". China rejected this approach, pointing out that it was "an internal matter" and not a threat to international security.